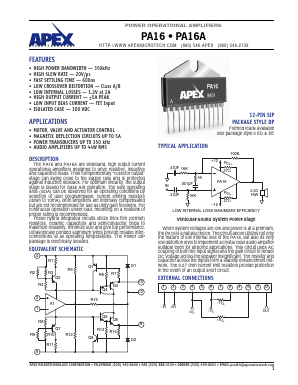 The PA16 and PA16A are wideband, high output current operational amplifiers designed to drive resistive, inductive and capacitive loads. Their complementary âcollector outputâ stage can swing close to the supply rails and is protected against inductive kickback. For optimum linearity, the output stage is biased for class A/B operation. The safe operating area (SOA) can be observed for all operating conditions by selection of user programmable, current limiting resistors (down to 10mA). Both amplifiers are internally compensated but are not recommended for use as unity gain followers. For continuous operation under load, mounting on a heatsink of proper rating is recommended.